ARTifacts: Pin to Win : My AIC Space- Take 2! Pin to Win : My AIC Space- Take 2! We heard you! Loud and clear. Our last Pin to Win contest became our most popular blog post of all time! Well, who doesn't like Pinterest? Especially Pinterest, and a chance to win a 30% discount towards your next Museum Shop purchase! 1. 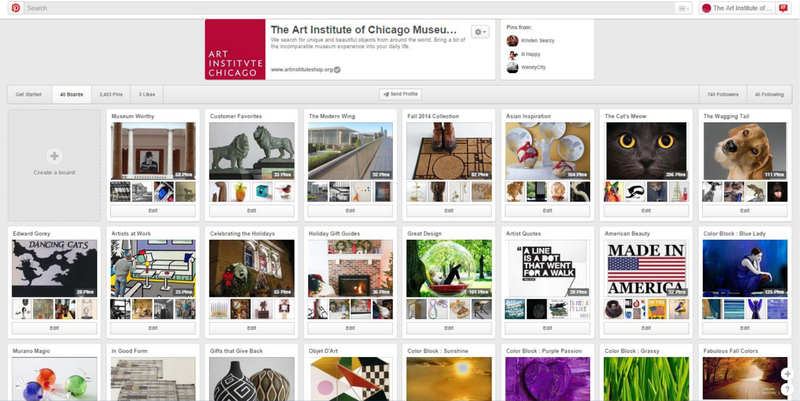 Follow the Museum Shop on Pinterest, here. 2. Create your own board titled My AIC Space. 3. Pin 5 of your favorite items from our 'Fall 2014 Catalog' board and 5 of your favorite items from any of our other Pinterest boards. Once you meet this quota, feel free to complete your look with any other inspirational products. 4. Once complete, leave a link to your board in the comments section of this blog post to be entered in the contest. You have from October 6th through November 3rd to complete your board and leave us the link. 6. The winner will be notified November 4th by a comment from us on their My AIC Space board. To Enter: Follow the Museum Shop on Pinterest and create your own board titled "My AIC Space", including at least 10 of your favorite items from any of of our Pinterest boards. Once complete, leave a link to your board in the comments section of the blog post. All links to entry boards must be posted in the comments section of the original blog post between 12:00 a.m. October 6 and 11:59 p.m. November 3, 2014. Prize Details: The prize is a promotional code for 30% off your next online order at the Art Institute of Chicago Museum Shop. The promotional code is available for one time use, cannot be applied to previous purchases, and applies only to new online orders placed from 11/5/14 through 12/5/14. The Art Institute of Chicago reserves the right to cancel any order due to unauthorized, altered, or ineligible use of discount and to modify or cancel this promotion due to system error or unforeseen problems. No prize substitution or cash redemption is allowed by the winner. All taxes on the prize are the sole responsibility of the winner. The Art Institute of Chicago reserves the right to substitute a prize of equal or greater value if featured prize becomes unavailable. Awarding of Prize(s) and Winner Notification: The Art Institute of Chicago ("AIC") is the sponsor and administrator of this contest. AIC will select a winner from all eligible entries received. The winner will be selected by a representative of the Art Institute of Chicago whose decisions on all matters relating to this contest are final. The winner will be notified in a comment posted by AIC on the winning entry board on Tuesday, November 4, 2014. ALL ENTRANTS ARE ADVISED TO MONITOR THEIR ENTRY BOARD ON THIS DATE AND REGULARLY THEREAFTER IN ORDER TO RECEIVE TIMELY NOTICES. The winner must contact AIC via email ataicshopblog@artic.edu by 5:00 p.m. CST on Tuesday, November 4, 2014 in order to provide his or her email address and claim the prize. AIC will not be liable for inability to notify the winner, whether due to inaccurate entry information, change of email address or otherwise. The winner agrees that the Art Institute of Chicago may use his or her name or likeness for advertising and publicity purposes without additional compensation (except where prohibited). Acceptance of the prize indicates acceptance of all the contingencies described herein and inherent to the prize offered. Eligibility: Contest open to legal U.S. residents age 18 or older. Employees of the Art Institute of Chicago, its advertising and promotion agencies, and the immediate family and household members of each are not eligible. All federal, state, and local laws apply. Void where prohibited. By participating in this contest, entrants waive all right to, and hold harmless, the Art Institute of Chicago and its advertising and promotions agencies from any loss, damage, or expense arising out of or in connection with participation in this drawing or the acceptance, use, or misuse of any prize. License and Release: By entering the Contest, entrant grants the Art Institute of Chicago the non-exclusive, royalty-free, and irrevocable rights to use, reproduce, publish, display, link, distribute, adapt, modify, and otherwise exploit, in whole or in part, entrant's board submitted for this Contest (the "Board") and to incorporate the Board, in whole or in part, in other works in any and all markets and media now or hereafter known worldwide in perpetuity. In the event that Entrant is awarded the prize, Entrant further grants the Art Institute of Chicago and its designees the royalty-free, irrevocable rights to use Entrant's name, image, and/or likeness, as well as the Board for any purpose whatsoever. Entrant waives any applicable rights of publicity or privacy in connection with the exercise of any of these rights. Entrants warrant that they have the sole and exclusive right to grant such rights to the Art Institute of Chicago and that the Art Institute of Chicago’s reproduction, publishing, displaying, and/or other use of their Board will not infringe on any rights of third parties. Any Entries with a photo containing material that is violent, pornographic, obscene, illegal, inappropriate, or racially or morally offensive, depicting third party trademarks or logos or that does not comply with these Official Rules or meet The Art Institute of Chicago’s standards for any reason, as determined by the Art Institute of Chicago in their sole discretion, may be rejected as ineligible for consideration. Entries must comply with all applicable laws, rules, and regulations. The Art Institute of Chicago shall have no obligation to copy, publish, display, or otherwise exploit the Board. Attn: "Pin It To Win It Contest"